Can’t believe that we are already knocking the doors of Diwali and within a matter of 36 hours we’d be celebrating in full light. I believe that since Diwali equals festival of lights, it should be there in full steam. Decked up my home with decorative Diwali special lights, diyas are painted. Diwali crackers are spread on a newspaper to soak sun's warmth. A ritual I have been following since long as my Dad once explained the more sunlight and heat the crackers absorbed, the better they will burn. And this takes me back to my childhood days when my hand eye coordination was at it’s peak during blasting crackers and making patterns by lighting up sparklers. So after about 25 odd years here I am a mum watching his husband and growing child safely burn crackers for one day and joining in once in a while. 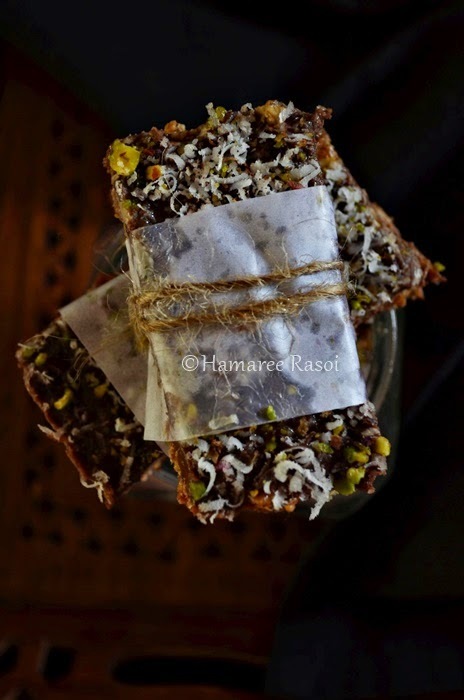 And for the guests who drop by, have prepared muesli and chocolate bars which I believe is an energizing and healthy sweet during Diwali. So let the countdown to the festival begins. Happy Diwali to all my friends and co bloggers. Line a rectangle pan with parchment paper and set aside. Pour coconut milk in a medium saucepan and heat over low flame. Bring milk to the simmer point and add the chocolate chips. Stir until the mixture is thick and chocolate melts completely. Another sign is the mixture will become glossy. In another bowl mix muesli pistachio and remaining nuts. Place half of the chocolate liquid over muesli mixture and mix well to combine. Now transfer this mixture to the prepared pan and spread evenly. 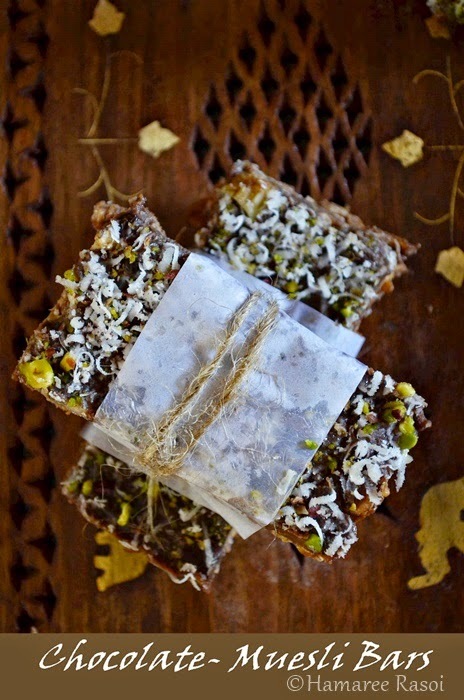 Garnish with remaining chocolate liquid, dried coconut, walnuts and pistachios. Refrigerate until firm, best is overnight. Transfer to cutting board and cut into equal bars. 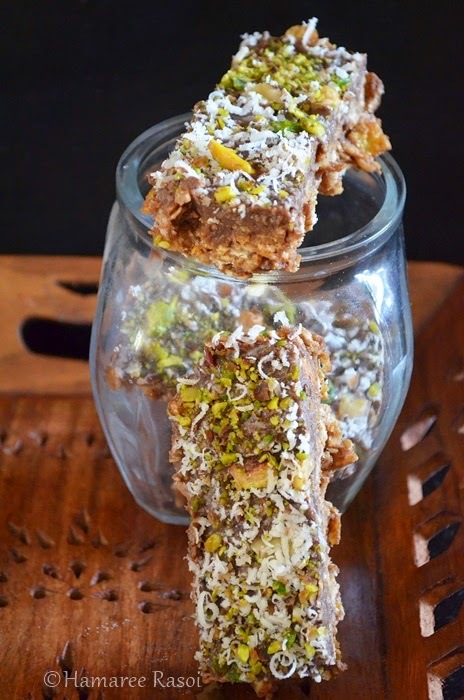 The bars look so beautiful, healthy and yummy..
Nice knowing via blogging. 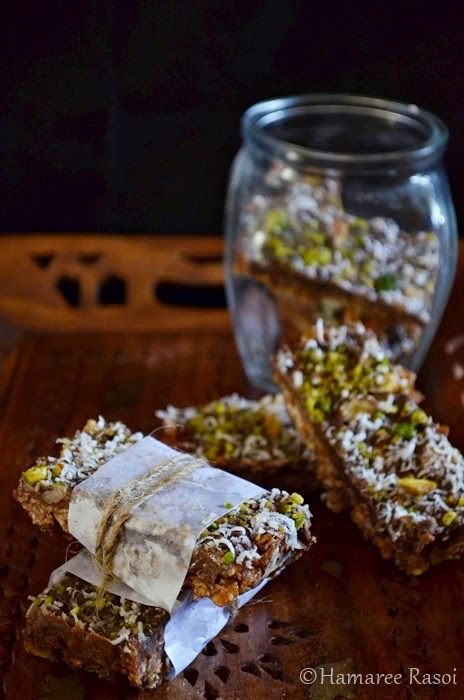 I came from Joyce's blog and I'm impressed with these nice and healthy bars that you have made.